Adam goes back in time to an era where Dan Aykroyd was trying to be a leading me and visits Doctor Detroit being released on Blu-Ray by Shout Factory through their Shout Select line. Those looking for something of a comedy and exploitation mashup ala Night Shift should look elsewhere. This odd-ball 80’s comedy has little bark and bite. Well-meaning but in the end Dan Aykroyd was never really meant to be a leading man, rather second fiddle (see: Dragnet, Blues Brothers, and Ghostbusters). Doctor Detroit is more fun in theory than actual execution, though it does have its moments. Aykroyd plays Clifford Skridlow aka Dr. Detroit, who is duped into taking the fall for Smooth Walker (Howard Hesseman). Skridlow cut from the same uptight WASP-y cloth Louis Winthrope III was cut from. As the story dictates, the meek professor has to find it in him to protect the Call Girls left in his. Whom must he protect these Call Girls from you ask? The nefarious and dangerous Mom (Kate Murtaugh). Yes, a Batman ’66 villain. 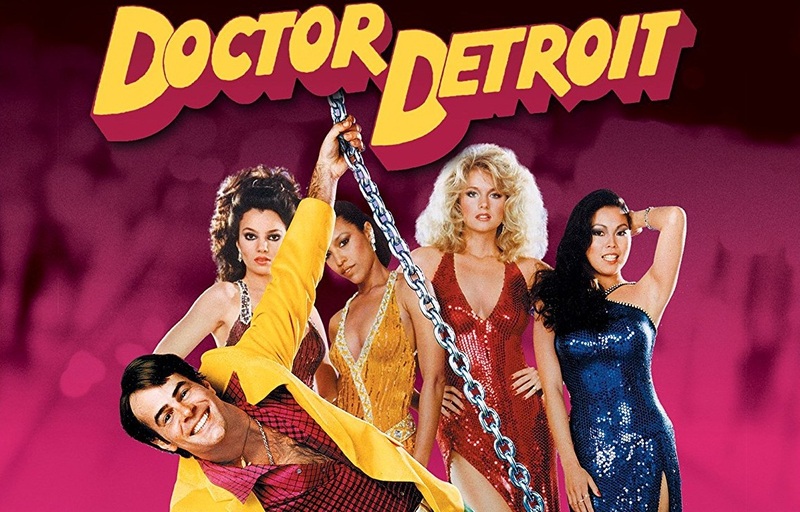 The only way that the professor knows how to help them and keep his uptight family from finding out is to take on an identity of the most dangerous pimp in the pimping game… Dr. Detroit. Will Dr. Detroit be another in a long line of exploiters or will he bring chivalry back to the Pimpin’ Game? Will it all end with the “where are they now” text that was made so famous by Animal House? Will we see what happened to Smooth? The answer is a definite Yes to all. The most shocking aspect of Doctor Detroit is just how toothless and congenial everything is. Minus the heavy amount of drug use, the film is fairly tame with content. Aykroyd plays the film like he was a modern day Danny Kaye, with a huge dollop of weirdness. It’s Aykroyd and the cast that life this one over-the-top in its best moments. It’s too bad that there are just not enough to pull it over from just decent to good or even great. Thankfully though there isn’t that moment wherein frustration that Aykroyd calls one of the women a “whore” or any other demeaning moment. The Cast is a murder’s row of comedic and dramatic actors in early roles. Hesseman is always gold and here he’s brilliantly cast as the slimeball Smooth. Donna Dixon, Lydia Lei, Lynn Whitfield, and Fran Drescher are cast as the ladies of Smooth’s small empire. Drescher is the standout as Karen, using her charms to great comedic effect. TK Carter shows up as Diavolo, Smooth’s righthand man who seems determined to help Skridlow succeed just to screw over Smooth. Collectively they do solid supporting work but ultimately the film resides on the shoulders of Dan Aykroyd. Doctor Detroit is fun albeit flat comedy with two truly inspired comedic set pieces. Though, the film oddly has aged better than any of its contemporaries (trust me, there were quite a few comedies in the 1980’s that plots revolved around white dudes setting up prostitution rings). The film benefits greatly from Aykroyd’s Danny Kaye-inspired performance as Clifford Skridlow and his alter-ego Dr. Detroit. Shout Factory has gotten a fairly flawless transfer from Universal. The film has benefited greatly from the 2K remaster that Shout has done. The film’s black levels are perfect allowing for a film that mostly plays out at night to not look washed out but look rich. There a few specs of dirt during the title sequences but the rest of the transfer looks good. The commentary by Pressman and Critic Dyball is definitely an interesting commentary, Dyball prompting the conversation by both Pressman’s answers and what’s occurring on screen. Pressman is engaged covering various topics as how he came to the project, Dan Aykroyd’s involvement, and a few behind-the-scenes anecdotes such as this film was done around the time of John Belushi’s untimely death and how that had affected the production. The new Interview with Michael Pressman covers some of the same ground that the commentary does but at fifty minutes is a bit more abbreviated and concise. The most interesting feature is Radio Free Detroit which was an EPK with interviews from the cast and crew for the release. The interviews are done as complete interviews or just answers that would allow the “interview” to fill in the questions to prompt answers. Shout has animated a Tape Recorder (similar to what they did with Gate II) and visual prompts. It’s these types of small touches that show just how much time and care are placed into all of their releases. The Photo Gallery, Theatrical Trailers, TV Spots, and Radio spots round out the special features. Shout Select continues their thoughtfully designed and produced releases. Doctor Detroit is no different. The film won’t win any new fans but those fans will love this great release and transfer. Shout Select’s Doctor Detroit on Blu-Ray April 24th.